Freemasonry is the oldest and largest fraternal society in the world. It was founded, in it’s modern form, just over three hundred years ago and has thrived ever since, now having well over six million members worldwide. For much of that time it has often been considered a ‘secret society’ and myths, legends and outright lies have plagued it since the earliest days. In an effort to correct these myths Freemasonry is undergoing a modernization process which enables the general public to see, and to understand, much more than in earlier days. Very little is still considered to be secret. Recently, the United Grand Lodge of England released a six-hour television documentary showing much of what goes on in Freemason’s Lodges today and, here in Spain, we are following the same route. 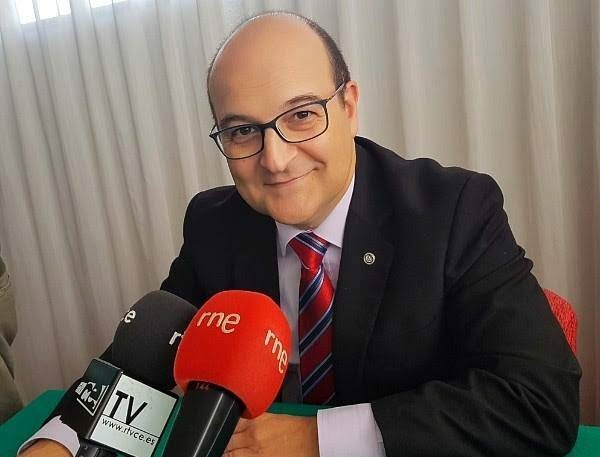 As one example of this I, as the Provincial Communications Officer, was recently invited to interview the Grand Master of Spain, the Most Worshipful Brother Oscar de Alfonso Ortega. 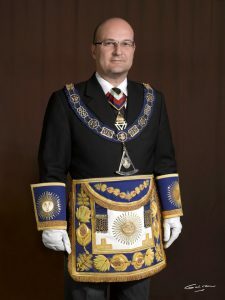 The most senior Mason in Spain. Señor de Alfonso Ortega was born, raised and still lives in Valencia, a city and Province that he loves. He went to school here and later studied at the University of Valencia to become a lawyer, before starting what was to become one of the most successful legal practices in the city. He was an amateur boxer, swimmer and a practitioner of scuba diving which have had to be curtailed a little since a recent brush with cancer. However, he is now, thankfully, fully recovered and wishes to continue with his swimming and scuba diving if perhaps not the boxing. 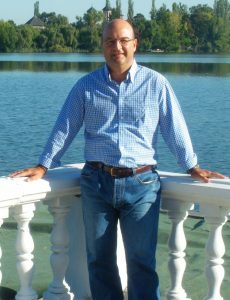 He is fifty-one years old, married to the lovely Dorita and has two daughters, Paula who is sixteen and Lucia who is twelve. Having joined Freemasonry in 1998, he later became the Worshipful Master of his Lodge; the highest rank one can obtain within a Lodge. Then, he was appointed as the Provincial Grand Master of Valencia before becoming elected as the youngest ever Grand Master of Spain in 2010. 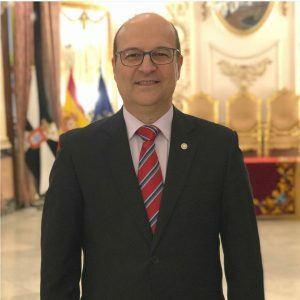 He has since been re-elected twice and is the only Grand Master of Spain ever to have served three terms. For the past three years he has also been honoured to be the President of the Inter-American Masonic Confederation. An organisation representing more than three hundred and twenty thousand Masons. He is the only non-South American ever to have been elected to that post. I started by asking the Grand Master how he had first become interested in Freemasonry. He told me that he has been interested since the very young age of fifteen, mainly because of what he then perceived to be the mysterious and esoteric character of the organisation. However, he had to wait a few more years before joining the fraternity. Another lawyer, who was a Mason, later put him in touch with his mother (first) Lodge, Germanies and, two years later, he was Initiated as a Mason. He said that the things which attracted him most was the friendship, loyalty and fraternity he found within the Lodge. He found it very easy to join and has never felt any animosity towards him for being a Mason. His friends, colleagues and clients are all happy that he is a Mason and he has never felt any need to hide the fact. Indeed, like most of us, he is proud to be a Mason and is happy to talk with anyone about this fascinating subject. It has however, had a huge impact upon both his home life and career. As he progressed through the ranks to the very top, he has had enormous claims made upon his time. Now, as Grand Master, he has also had to travel all over the world, so far visiting more than fifty countries. He tells me he has visited, the UK, the US, almost every country in South America and virtually every country across Europe. Fortunately, his wife understands these heavy burdens and is very supportive of him. I then asked what he would most like to change about Masonry. He replied that what he would like to see most of all, is a more positive image for the organisation, which he is trying hard to provide. There are still some who perceive it to be ‘secret’ and closed to outsiders. Nothing could be further from the truth. He wants Masons to be proud of what they are and what they do and to persuade others that Masonry is a good, caring and rewarding society who do a tremendous amount of good for the sick, less able and generally under-privileged people of the world. To someone thinking of becoming a Mason he advises that they should not read and believe what they see in books, films and on the Internet. Most of which is, at best, incorrect and, at worst, often rubbish, but to discover the truth for themselves by approaching a Lodge directly. To then trust their Brothers and be tolerant of them. Having joined they should, above all, enjoy belonging to the Lodge. Freemasonry is fun. While we work hard at times there is always time to enjoy being together and learning about new people and new ideas. ‘It is time’, he said, ‘that Freemasons should become well known, to shake off all the false images. It is time to approach non-Masons and explain to them what Masonry is really about. It is time to be even more open, to be proud of what we have done and what we are continuing to do’. He said that if he were asked to give advice to his eventual successor, he would suggest that he should ‘listen a lot but speak only a little’. Finally, when he finishes his term as Grand Master, he would like to be remembered as a man who brought peace and fellowship to Masonry, who helped to organise it and change it into a more modern Order and who left it in a better state than when he became Grand Master. My thanks to the Grand Master for giving me so much of his valuable time.